Artists: Arlene Turner Crawford and Dorian Sylvain. Organized by South Side Community Art Center, Bronzeville. Located south of the 43rd St. walking bridge. 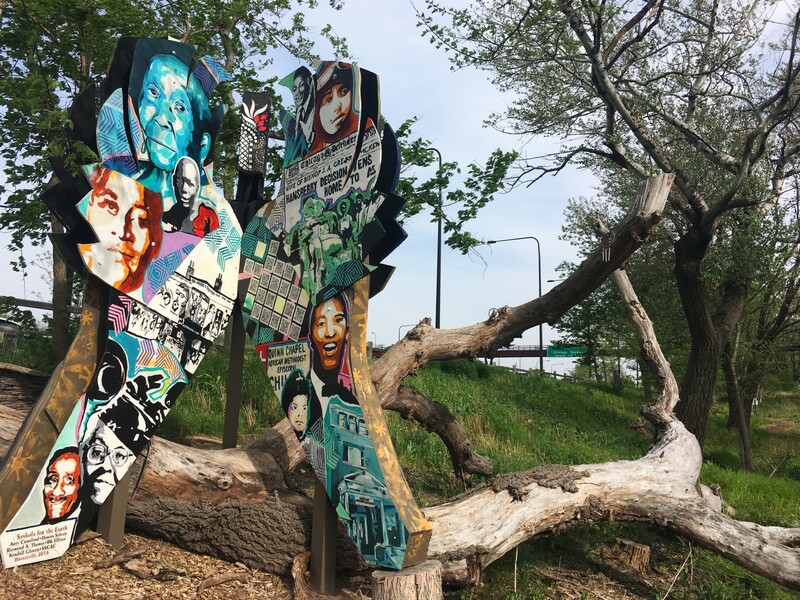 “Sankofa for the Earth” features a “Sankofa” bird made from recycled materials and uses a mixed-media creation of painting, mosaic, and wood in order to take its shape. In the Ghanaian language Twi, Sankofa means “go back and fetch it.” The Sankofa is a symbol resembling a bird looking backward over its tail, reflecting the belief that our pasts hold important information to move us forward in life. The installation itself is a majestic beauty that feels out of place, its bright colors and intricate design standing out from the natural greens and browns of the surrounding trees and dirt. One could spend an afternoon piecing together the intricate details that makes it such an interesting work on the seating made from repurposed wood around the installation. Artists: Fo Wilson and Norman Teague. Organized by Bronzeville Community Development Partnership, Bronzeville. Located south of 35th St. and west of Lake Shore Dr.
Several organic, amorphous sculptural forms spread out in a circular patch make up “Sounding Bronzeville.” These forms rise up from the ground at differing heights and shapes, all covered in the native plant material that surrounds them. Their function allows them to define the boundaries of the area they find themselves in and also allows for visitors to come and sit upon them to rest. While unassuming at first, the piece is an interesting, subtle addition to the park, one that blends in with its already beautiful surroundings and gives back to it. Artists: Georgina Valverde and Diana Solis. Organized by Contratiempo, Pilsen. Located south of McCormick Place Bird Sanctuary, by the lakefront at 2400 S. Lake Shore Dr.
Based on the interior design of a conch shell—or “caracol,” in Spanish—this large spiral represents the desire to belong while maintaining the core of one’s own identity and memories, according to the project’s organizers. The large, open-ended spiral structure can function as a place of work, if need be. Even better, it would suit a relaxing picnic, as its ending point turns into a spiraling table with multiple seats for weary travelers. The artists intended the space for recreation and even for performances; just on its outer edge is a small platform for anyone trying to show off to those around them. You can sit near or upon this artwork and gaze out at the seemingly endless lake, or turn back to marvel at the city’s skyline. Artists: Hector Duarte and Alfonso “Piloto” Nieves. Organized by Casa Michoacán, Pilsen. 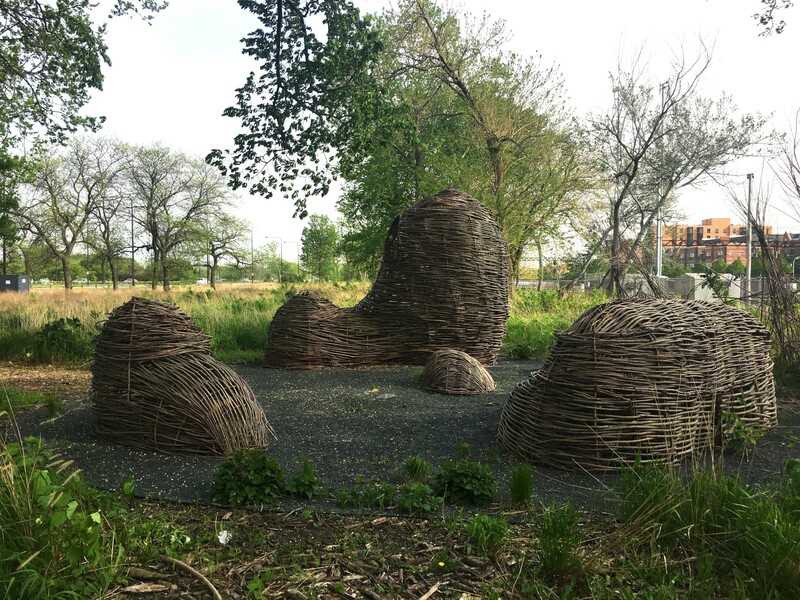 Located south of the 31st St. Harbor, around 3300 S. Lake Shore Dr.
A circular structure that brings to mind druidic rituals, this installation is inspired by the magic symbolism of the butterfly, harmony with nature, and migration. 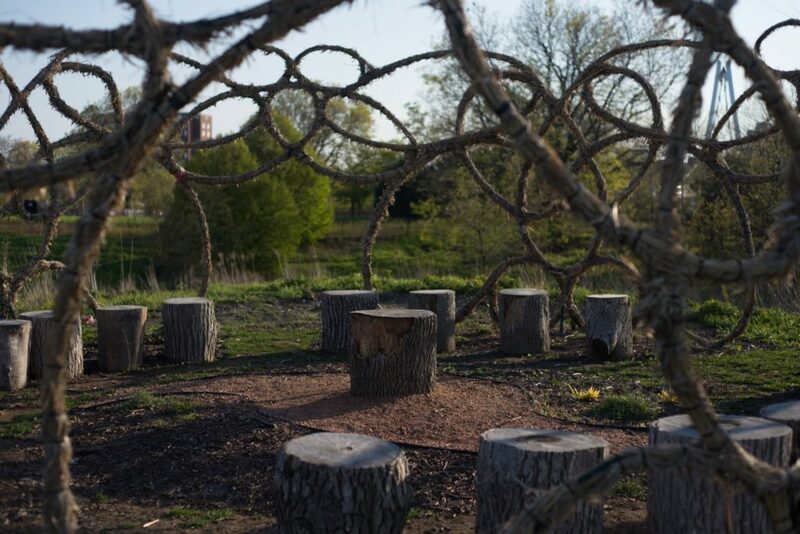 The fence around many tree stumps arranged in a circle takes on a looping butterfly form that feels as magical as the insect that inspired the project. The hill it is located on allows a wide view of the nearby harbor and gives an added sense of adventure to its discovery—once you’ve climbed the hill, you may gaze upon its odd wonder. This fabrication stands in the face of nature, but is its near equal in charm. Artists: Andy Bellomo and Anna Murphy. Organized by Chinese-American Museum of Chicago, Chinatown. Located south of Oakwood and west of Lake Shore Dr., around 4000 S. Lake Shore Dr. This installation’s main goal was to recreate the look of a traditional Chinese “scholar’s rock,” which is shaped and eroded by nature into unusual forms. To do this, Andy Bellomo and Anna Murphy needed to sculpt, mold, and fabricate the sculpture in such a way that visitors could regard the rock with that certain grace or magnificence that is associated with the traditional idea of a “scholar’s rock.” Its place in the center of a tranquil rock garden certainly helps, along with the log bench and stump for sitting. 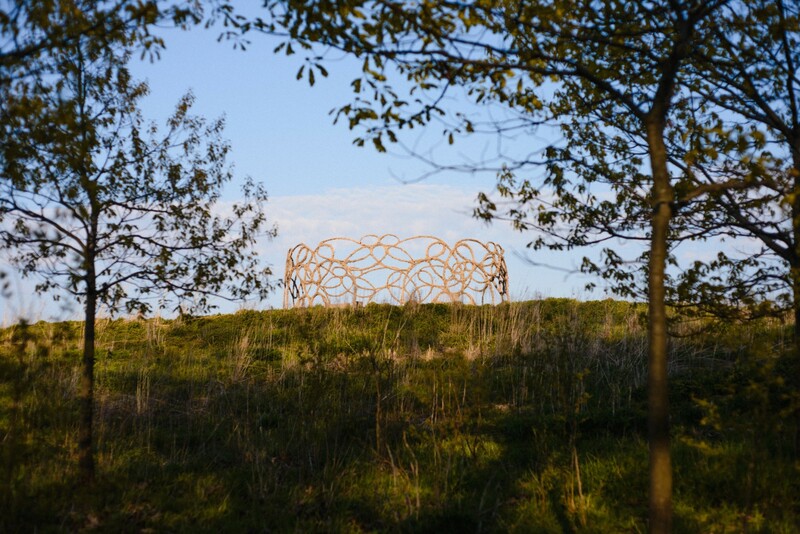 Though it does not offer the same type of sitting space as the other installations, which have seating incorporated into their design, the rock offers a chance for greater examination and self-reflection. Here, a visitor can take time to gaze at the artwork from afar, as one might in an art gallery or other art space. The path to these works is fairly long—finding them could be considered a small quest in itself. What makes matters more interesting is that the path itself is not grandiose; one could mistake it for a naturally made path constructed by frequent forest travelers. The path’s unassuming quality leads the spectator to consider where they might be headed, and if there’s anything down that road. Thankfully, occasional roadway markers help guide the way, as each individual Gathering Space also comes with a logo that can be found along the main paths of Burnham Park. Meanwhile, if you find yourself unable to traverse the narrow Burnham Wildlife Corridor path, on the main path through the center of Burnham Park lie several sculptures that call less attention to themselves. Think of them as Easter eggs in an already marvelous adventure. On the journey to locate these artworks, you might find yourself questioning their purpose: is it greater than simply the gathering spaces that they claim to be? One can appreciate the beauty of their independent creation, reflect upon the neighborhoods that they are made to represent, or simply bask in the charm they exude through their sheer existence. Parks, known for the natural beauty they represent to their city, aren’t always associated with the art placed within them, and those works seldom add more to their location than the aesthetic value. Yet these spaces have both form and function—they act as public art truly made for the public, not just for the sake of beauty but for use, interaction, and the enjoyment of visitors to the park.